Firecracker is becoming quite the reader. I just think it's sweet and cute when she reads to Boy. Her reading skills aren't exactly tested here with "Polar Bear, Polar Bear, What do you Here?" since everyone in the family has it committed to memory. It's Boy's favorite...well except maybe for "Brown Bear, Brown Bear, What do you See?" Firecracker is getting really good at reading books that are new to her, and it's fun to see. 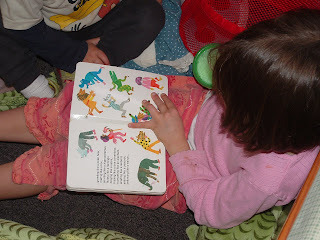 Somewhere, I have a picture of YOU (Polly) reading to YOUR little brother, David, when you were about the same ages.